A Flexible and Interactive Toolkit for Driving Assessment. 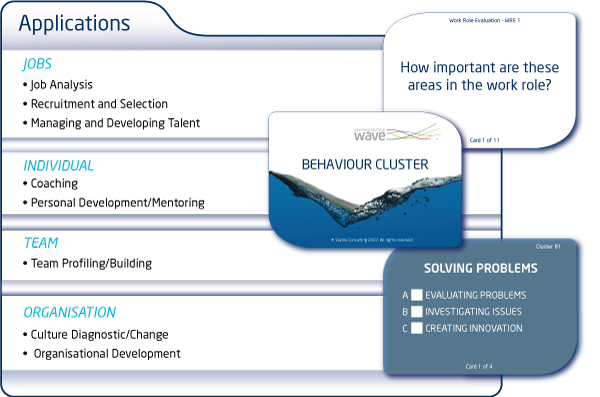 The Wave Performance and Culture Framework forms the basis of the suite of Saville Consulting assessments. Available as a card sort, the content reflects the behaviours, abilities and global measures which research has identified as key to driving performance and potential in roles, teams and organisations. Card sort exercises provide an engaging, involving and interactive experience for line mangers, HR teams and consultants. They can be used to compare and contrast views across a wide range of applications. The Framework is built around the Saville Consulting Behaviour, Ability and Global Measures, each represented on a set of cards. These are supported by a series of question cards and a choice of five rating scales. The cards are packaged with data collator spreadsheets and a User Guide. The Guide introduces the Wave Performance and Culture model and advises how to facilitate effective one-on-one and group ‘card sort’ sessions.